WASHINGTON–The First Focus Campaign for Children applauds the introduction of the American Family Act of 2017, which would expand the Child Tax Credit to more effectively target low-income families and thereby reduce child poverty. Introduced by Senators Michael Bennet (D-CO) and Sherrod Brown (D-OH), the proposal would triple the maximum value of the Child Tax Credit to $3,000 per child ($3,600 for children under six), index the credit to inflation, and for the first time, make it fully refundable. The bill would also distribute the CTC as a monthly $250 credit ($350 for children under six), giving families support throughout the year to address monthly expenses rather than forcing them to wait for an annual lump sum. Unlike last month’s flawed “Big Six” tax Framework, which targets an expansion of the Child Tax Credit to middle class and wealthy families, Bennett and Brown’s proposal would target families with the greatest need and provide critical support for families with children who are struggling to get by. 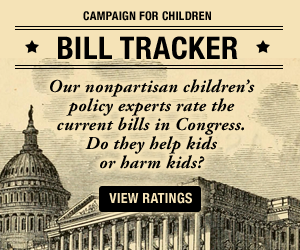 “We enthusiastically support this proposal from Senators Brown and Bennett, two tireless champions for children on Capitol Hill. We know that increasing household income leads to improvements in child development and educational attainment. The American Family Act of 2017 would go a long way in improving outcomes for our nation’s children.